The second Golden Age of bird books shows no signs of abating as of early 2002. Indeed, so many worthwhile books came out in 2001 that it almost seems unfair to select a few for special honors. Here are the winners. Further comments (and perhaps additional awards) will be added as time permits. I wish to thank the authors, artists and editors who have toiled to make these fine bird books available, usually for minimal financial gain. Birdwatching Guide to Oman, by Hanne & Jens Eriksen and Panadda & Dave E. Sargeant. Al Roya Publishing 2001. 253 pages. Covers 60+ top birding sites. 92 color photographs, 64 full-page color maps, and 22 line drawings. (Sample pages.) Distribution grid, annotated Bird Finder showing where to find each species, monthly bird calendar, and Oman bird checklist. This is the finest bird-finding guide I have ever seen. It contains everything you will need for a birding trip to Oman, including accommodations and transportation directories with telephone numbers and URLs. Oman is a safe country on an important migration route between Asia and the Horn of Africa. At the time of publication, 468 species of birds had been recorded. The number is certain to increase, as this book already seems to be causing an uptick in birding tourism to Oman. Online updates. Clemencia Rodner, Miguel Lentino & Robin Restall. Checklist of the Birds of Northern South America: An annotated checklist of the species and subspecies of Ecuador, Colombia, Venezuela, Aruba, Curaçao, Bonaire, Trinidad & Tobago, Guyana, Suriname and French Guiana. The genus Sylvia includes such common European songbirds as the Blackcap and Garden Warbler, localized endemics including Cyprus Warbler, Sardinian Warbler, and Rüppell's Warbler, and the species formally placed in Parisoma (eg, Yemen Warbler). (For those in North America without European field experience, the closest relative of Sylvia is the Wrentit, Chamaea fasciata.) Identification of silent birds in non-breeding and sub-adult plumages during migration can be problematic. This book provides exhaustive coverage of the attractive and interesting genus, comprising 22 species recognized by the authors. The numerous hand-held color photos are particularly helpful in illustrating differences among confusing plumages. I wish that there were a book like Sylvia Warblers on every confusing genus. It compiles and greatly expands upon the best information and articles from British Birds, Dutch Birding, and Birding World. While paintings clearly work best for identification of most birds, good photographs when available may be preferable for hummingbirds, as they usually are for butterflies. Hummingbirds often approach very closely, permitting careful observation of minutiae. Nevertheless, nondescript female and immature birds are not identified or are misidentified on nearly every Neotropical trip due to the absence of adequate field guides. There is considerably less chance for error in the U.S., where only 24 species have been recorded. This specialized guide should solve most of the difficult field problems, including identification of vagrant Rufous/Allen's Hummingbirds, given adequate views. The Red-cockaded Woodpecker is one of the most threatened birds of North America, mainly as a result of industrial logging and fire suppression in the southeastern pine forests where it lives. Two of the four localities where I have observed Red-cockaded Woodpeckers no longer have any birds, which is representative of the wholesale range retraction in recent years. This is an outstanding study that covers the history, ecology, and conservation of Red-cockaded Woodpecker and the endangered southern pine communities in which it lives. Anyone interested in woodpeckers will appreciate the detailed life history information. 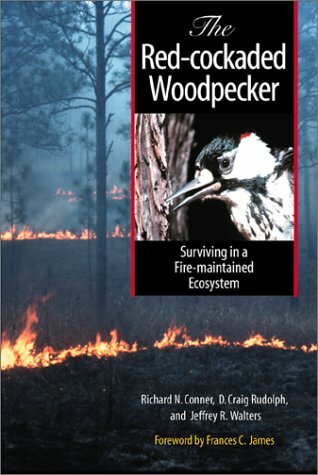 It is ironic that thanks to the work of Red-cockaded biologists such as the authors of this book, detailed ecological information about this rare species is more easily accessible than information about many common woodpecker species. An outstanding field guide: see my review on the WorldTwitch Bird Book Discussion Board. The important birding areas of Uganda and central and southern Tanzania finally have received excellent coverage in a modern field guide. The text has been kept concise in order to fit on pages facing the plates. Be sure to place a full-length bookmark in your copy to prevent the red maps from reflecting onto the bird paintings. Robert S. Ridgely & Paul J. Greenfield. The Birds of Ecuador. 2 volumes. Cornell University Press & Helm. 2001. This 2-volume set represents another great leap forward in South American ornithology. Separating the field guide into a second volume enabled the authors to avoid the artificial constraints that a one-volume format would have imposed. While it still would be advisable to take both volumes on a trip to Ecuador, the first volume may be left in a hotel room or car. Perhaps this category is a bit of a stretch, but I think that it's important to have a modern field guide to the Seychelles, home to some of the world's best-known rare birds, including the recovering Seychelles Magpie-Robin and recently extinct Aldabra Warbler. The guide should be beneficial for nature tourism, which would be far preferable to additional resort development. This is a particularly difficult category to judge, as there are a number of worthy contenders. I suppose the choice tilts as much toward one's individual preferences as anything else. Hawk enthusiasts might choose the hefty new Raptors of the World book, sunbird fanciers the Sunbirds book, thrasher chasers the Wrens, Dippers and Thrashers book, and so on. My own preferences are to look at the color plates of ground pigeons and fruit pigeons from the Asian and Australasian Islands in Pigeons and Doves, and similarly, to study the plates of thrushes from the same regions that are almost impossible to see well in the wild, in the Thrushes book. In addition, the massive new Nightjars and Their Allies contains additional information not in the more compact Nightjars book by Cleere (1998). While all the species covered in bird families treatises either have been or will be covered in the Handbook of Birds of the World, the single volumes are more easily accessible than HBW and offer plates that may or may not be better than those in HBW, but are different, and some species have rarely been illustrated or photographed. While the book is dated 2000, I believe that it was released in North America in 2001, hence qualifying for this year's awards. Besides providing a handy single-volume wildlife guide for Latin America's dominant ecotourism destination, this book demonstrates that skillful computer graphics work can make a photographic field guide attractive. For those of us lacking even the most rudimentary artistic ability, it is encouraging to see that technology can help make up for human deficiencies. This is quite simply the best birding adventure book I have read in many years. Each chapter is about a different, successful expedition in search of cranes. What's missing, out of necessity, are the details that twitchers crave, such as annotated species lists and stakeout maps. They might have required an appendix as long as the text. A solution for adventure books aimed at a general audience might be to post species lists, maps, itineraries and other relevant information on a website for the few especially keen readers. David L. Wagner, Douglas C. Ferguson, Timothy L. McCabe & Richard C. Reardon. Geometrid Caterpillars of Northeastern and Appalachian Forests. Forest Health Technology Enterprise Team, U.S. Department of Agriculture. Publication FHTET-2001-10 (September 2001). 237 pages. Covers approximately 190 species, with a 3" x 4.75" color photo of each caterpillar (live) and a color thumbnail photo of each adult moth (specimen). Free. For copies, contact Richard Reardon: rreardon[at]fs.fed.us.